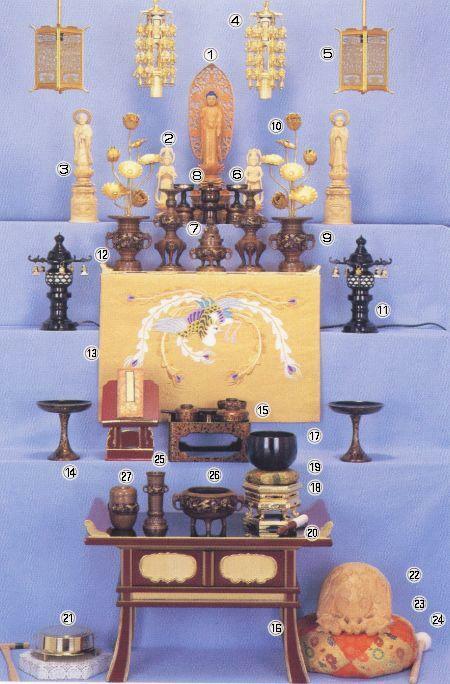 The concept of "shoogon (shogon, shougon, shohgon)" is already mentioned in the Lotus Sutra (Hokkekyoo, Hokekyoo 法華経; Saddharma-pundariika-suutra)； it indicates "lavish embellishment" "great decoration in supreme beauty". Buddha statues are embellished with robes and other implements. The lavish embellishment is produced by special materials, like gold, silver, brocade and so on. It is also produced by the finest and most detailed work of the craftsman, in carving, stitching, weaving the items. Preparing an item for decoration in the temple hall was a holy, worthy deed in itself and promised a step nearer on the road to paradise. The word "shogon" means "to decorate Buddha with magnificence." From the time Buddhism was first brought to this country, or around the middle of the 6th century, Buddhist images were decorated in increasingly different ways. 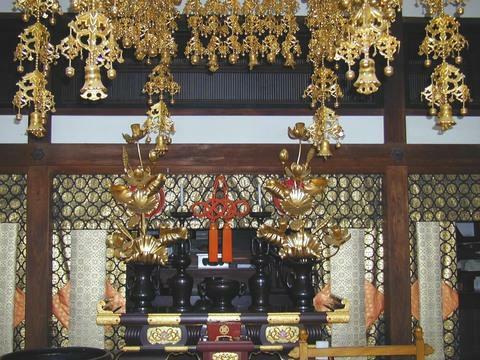 Images that were enshrined in the main halls of Buddhist temples gleamed with the color of gold. Around them there were decorations such as lotus blossom ornaments, brilliant colored cloth and reliefs on tiles painted with green enamel called "sen."There were also brilliantly colored frescos to round off the magnificent decorations. Towering Stupa were built where relics of the Buddha were preserved in containers and where gold and silver colored ear ornaments and neck ornaments made with blue and yellow colored beads and other glistening objects were kept. All these things of the Buddhist world that were written in sutras are not usually displayed in present times. Through these splendid conceptual writings, people aspired to the world of Buddha. Let us try and contemplate the Asuka-Hakuho culture that went through this period of "Shogon" of the first days of Buddhism and the beginnings of international influence were established. The above text unless links are given is mostly quoted from my book about Buddhist ritual tools. Eine Erläuterung zum Begriff des "shoogon" findet sich bereits im Lotus-Sutra (Hokkekyoo, Hokekyoo; Saddharma-pundariika-suutra) und bedeutet etwa "Schmuck in erhabener, reiner Schönheit". 1. Tathaagata-Buddhas und Bodhisattvas schmücken sich selbst durch ihre guten Werke und Tugenden. 2. Der Körper eines Heilswesens, repräsentiert durch eine Statue (butsuzoo), wird mit verzierenden Gegenständen geschmückt. 3. Das Reich Buddhas, repräsentiert durch die Tempelhalle, wird mit schönen Gegenständen geschmückt. Im Rahmen dieser Arbeiten fuer das Daruma Museum wird ein "prächtiger, schmückender Gegenstand" der Kürze halber als "rituelles Schmuckobjekt" bezeichnet, obwohl diese Übersetzung nicht allen Nuancen dieses Begriffes gerecht wird. Zu den rituellen Schmuckobjekten für eine Statue gehören die in den folgenden Abschnitten ausführlich besprochenen Gegenstände: Baldachin, Altar-Plattform, Tabernakel u.a. Nimbus und Sockelformen sowie Schmuckstücke direkt am Körper einer Statue wurden bereits in meinem Buch über Buddhastatuen abgehandelt. Zu den rituellen Schmuckobjekten in einer Tempelhalle gehören Priestersitz und Tische, Banner, Schmuckgehänge u.a. Durch die Vergoldung und den Schmuck einer Statue, das auserlesene Material der Schmuckgehänge und Banner, die feinen Schnitzereien und Lackarbeiten eines Tempelraums wird versucht, dem Gläubigen eine möglichst naturgetreue Vorstellung vom Paradies im Westen (gokuraku joodo) zu vermitteln. Diese Bemühungen haben zur Verwendung auserlesener Materialien und der Herstelung einer Vielzahl von schmückenden Gegenständen geführt und im Laufe der Jahrhunderte Generationen von Kunst-Handwerkern beschäftigt. Exhibition "Kazari: The Impulse to Decorate in Japan"
. shippoo 七宝 （しっぽう）cloisonne, enamel . It happened in the 10 lunar month in 1810. A box with the Hokekyo Sutra was found in the sea of Kitagawa village in Fukagawa. The fishermen brought it to the 町奉行所 city magistrate office. When they checked carefully, they found an inscription dating back to the 12th lunar month of 1757.